[119 Pages Report] The synthetic gypsum market was valued at USD 1.37 Billion in 2017 and is projected to reach USD 1.80 Billion by 2023, at a CAGR of 4.82%. The base year considered for the study is 2017 and the market size is projected from 2018 to 2023. The report aims at estimating the market size and future growth potential of the synthetic gypsum market across different segments, such as type, application, and region. The other objectives include providing detailed information regarding the main factors influencing the growth of the market (drivers, high growth opportunities, and industry-specific challenges). It also aims to study the individual growth trends, future prospects, and contribution of various segments to the total market. The study also analyzes opportunities in the market for stakeholders and provides details of the competitive landscape for market leaders. The study strategically profiles key players and comprehensively analyzes their core competencies. The synthetic gypsum value chain includes raw material manufacturers such as USG Corporation (US), Lafarge Holcim (Switzerland), Delta Gypsum (US), National Gypsum (US), Synthetic Materials LLC (US), Constantia Building Products (US), and KNAUF GIPS (Germany). The other players include American Gypsum (US), PABCO Gypsum (US), British Gypsum (Europe), Georgia-Pacific (US), FEECO international (US), and Gyptec Ibèrica (Portugal). The products manufactured by these companies are used by various end-use sectors. The end-use sectors comprise industrial, construction, agriculture, and food & beverages, among others. The application of synthetic gypsum components in these sectors is because it is a recyclable, environment-friendly, lightweight concrete material, and can also be used as a fertilizer in soil amendment to improve crop productivity. MarketsandMarkets projects that the synthetic gypsum market size will grow from USD 1.42 Billion in 2018 to USD 1.80 Billion by 2023, at a CAGR of 4.82%. The synthetic gypsum market is expected to witness high growth as a result of the rapid urbanization, large-scale investments in the building & construction sector, the rising number of construction activities in emerging economies, and increasing demand from the construction sector. This report has been segmented on the basis of type, application, and region. The drywall application is projected to be the fastest-growing segment in the synthetic gypsum market during the forecast period. FGD gypsum is used in the agriculture sector as a fertilizer to improve crop yield; it is mainly added as sulfur or calcium fertilizer in the soil. In the construction sector, it is used as a filler material in cement and plasters to enhance strengthening and reduce the setting time of the concrete. It also finds application in the building & construction industry to make decorative panels and PoP structures. In terms of value, the phosphogypsum segment is projected to grow at a higher CAGR during the forecast period. This growth can be attributed to factors such as its wide range of application in the agricultural sector for soil amendment and as a fertilizer to treat alkaline soil and improve overall crop productivity. Currently, the Asia Pacific region is the largest consumer of synthetic gypsum products. China, the US, and Germany are among the major markets of synthetic gypsum. The Asia Pacific synthetic gypsum market is projected to register the highest CAGR during the forecast period. 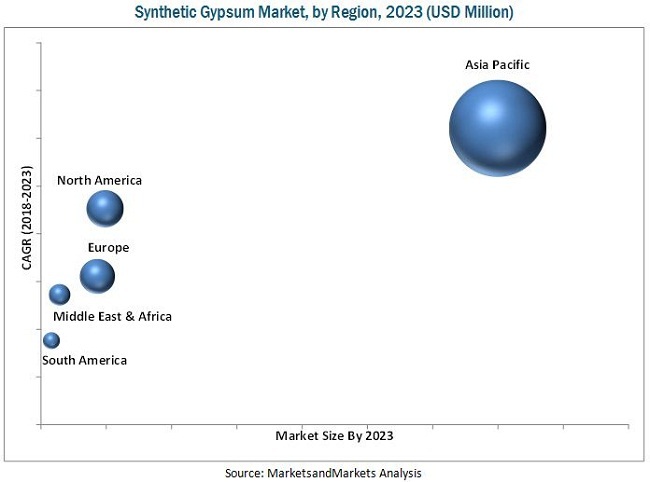 The rising number of infrastructural activities, as well as the large population in China and India, drive the growth of the Asia Pacific synthetic gypsum market. Additionally, other emerging economies such as South Africa and countries in the Middle East and South America are experiencing high demand for construction. The rapid urbanization in these countries demands faster and cheaper construction of buildings and facilities without compromising on the quality. Additionally, the increasing number of government investments in infrastructural constructions provide the potential for growth of the synthetic gypsum market in these countries. Factors such weak economic conditions in many European countries as the aftermath of the financial recession of 2008–2012, fluctuating costs of raw materials, and infrastructure in developing countries might restrict the growth of the market. The global synthetic gypsum market is dominated by players such as USG Corporation (US), Lafarge Holcim (Switzerland), Delta Gypsum (US), National Gypsum (US), Synthetic Materials LLC (US), Constantia Building Products (US), and KNAUF GIPS (Germany). The other players include American Gypsum (US), PABCO Gypsum (US), British Gypsum (Europe), Georgia-Pacific (US), FEECO international (US), and Gyptec Ibèrica (Portugal). These players adopted acquisitions, investments, joint ventures, and strategic alliance as the key growth strategies to expand their presence in the synthetic gypsum market.